Welcome to Word Trek answers. Of course, you do get stuck as you play but the problems aren’t that challenging as you can expect. In fact, that’s what really aids you go along, because you can get help from others whenever you play. It’s a cool addition to the game and it does enrich the social aspect of the experience. If you didn’t get the image you wanted, just enter more letters in the search box. You can go to the homepage of word trek answers, or just use the search module below. 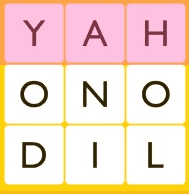 Enter the first 3 or 4 letters of the top row (or more letters, optional). You can enter in the search box the letters YAHO and then pres enter. The more letters you put, the better the result will be. You can just enter 3 letters, but sometimes there will be many results to choose from. If you enter 4 or more letters, you can forget to set the grid number and press directly enter. Word Trek is avalable for Android and iOs (Iphone, Ipad and Ipod touch). Word trek is free to download. Don’t forget to bookmark this page or share it to Twitter or Facebook.